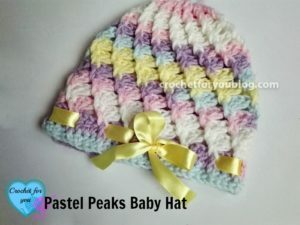 Deck out your little ones head with this beautifully laced and textured baby hat. It’s designed to fit a 3-6 month old, and would be so fitting for the little girls. The pattern calls for a light weight yarn and a 5mm crochet hook. If you enjoyed this free crochet pattern you might also enjoy more designs by Crochet For You.